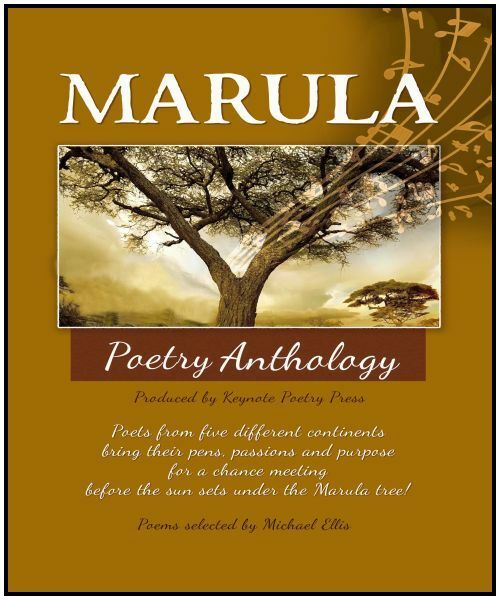 "Marula Poetry Anthology is a fantastical event initiated by Poet Michael Ellis and Keynote Poetry Press. The title of the Anthology, Marula is the name of a tree in Africa that provides sustenance for people and animals, healing and shelter from the hot sun, not unlike poetry. The Anthology is an international peace accord featuring selections from Poets around the world, India to Africa, Australia to Micronesia and the United States. Keynote Poetry Press and Michael Ellis (Poet, Poetry Editor, Teacher) is the Administrator at the Facebook site Poetry Pen & Ink (part of the book is from the most popular poems sent in), as well as his considered picks. The poetry in this Anthology is about the poetry, a post-modernist progression that dances with Beat poetry, the Romantics and Imagist influences. A mix of emerging and established Poets, a truth telling recounting themes of violence against women, a celebration of family, about being, about death, about romance and everything in-between, a lovesong to the world. Marula is presented in a new format that includes photos and quotes by the Poets that make the work come alive . . . as all these fantastical Poets with fantastical poetry, largely unknown, live and thrive in the sunshine under the Marula tree. This poetry moves the world. Marula by Michael Ellis and Keynote Poetry Press."